EJB is a framework for Java, so the very first requirement is to have a Java Development Kit (JDK) installed in your machine. Now open console and execute the following java command. If you do not have Java installed, install the Java Software Development Kit (SDK) from https://www.oracle.com/technetwork/java/javase/downloads/index.html. We are assuming that Java 1.6.0_21 as installed version for this tutorial. Append Java compiler location to System Path. Windows Append the string ;C:\Program Files\Java\jdk1.6.0_21\bin to the end of the system variable, Path. Verify Java Installation using java -version command explained above. You can download the latest version of JBoss Server from https://www.jboss.org/jbossas/downloads/. Download the archive as per the platform. 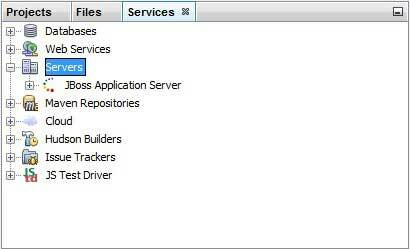 Extract the Jboss to any location on your machine. Open Plugin window using Tools > Plugins. Open "Available Plugin" tab and select "Java EE Base" and "EJB and EAR" under "Java Web and EE" category. Click install button. Netbeans will download and install the respective plugins. Verify plugins installation using "Installed" tab (as shown in the image given below). 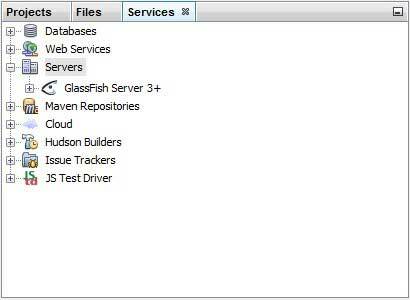 Go to Services tab and right click on servers to add a new server. Add Server Instance wizard will open. 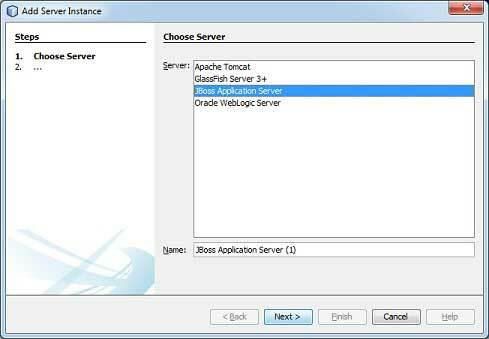 Select JBoss and in next step enter the relevant details to configure server in netbeans. Once everything is configured, you will see the following screen.